Wear gloves when picking figs: the sap in their leaves and leafstalks irritates the skin. Old-fashioned fruits full of charm. Fig, medlar, mulberry and citrus trees were 19th century favourites that are now enjoying something of a revival. To be successful with these fruits you must take a little extra care, but there are some tried and tested techniques to help you establish them in your garden. A successful crop: The good news about growing figs is that they do not require a pollinating partner and they can grow in nearly all British soils, as long as they are free-draining. Also, pests and diseases rarely affect them. Growing figs only gets complicated when you want to harvest fruit every year rather than growing them simply as an ornamental plant. 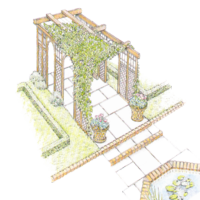 To produce a good crop of fruit the roots need to be restricted by either growing the tree in a planter or by lining the planting hole with paving slabs. In the South of England figs will grow happily against a sunny wall, while in the Midlands you can have success if you find a really sheltered, sunny spot. Figs will need protection from the frost to avoid damage - nowadays this can easily be done by covering with horticultural fleece. Varieties to look for: The most commonly sold fig for outdoor use is the very hardy 'Brown Turkey', a variety that ripens in August to September. Another hardy fig is 'White Marseilles', which has early fruit with white flesh and an excellent flavour. This fig is often successfully grown in a planter. In the greenhouse opt for 'Rouge de Bordeaux', which has purplish-green fruits. Figs are commonly sold already fan-trained for planting against a wall. Dry and chalky soil for a fig tree: Although it is particular when it comes to climate, the fig tree, once settled, grows happily in the most barren of city garden soils. The best time to plant is in early spring when the risk of heavy frosts has passed. 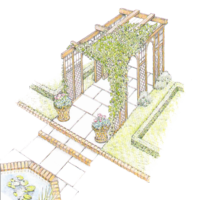 Plant in a deep hole with a layer of stones at the bottom and paving slabs to the sides to restrict root growth. Water copiously in its first summer. 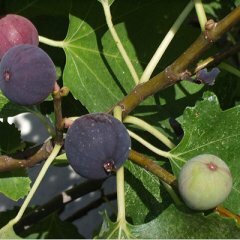 Low-maintenance pruning: Mature figs need little pruning - simply remove any shoots that are crowding each other and preventing a good airflow around the branches. After the first crop on a new tree, pinch out the lateral shoots, leaving a shoot with four leaves on. This will encourage replacement fruit-producing stems. Growing figs in a planter: If you intend to move house in the near future plant your fig in a planter so it can go with you. The planter should have a capacity of at least 50 litres and be filled with ordinary soil. Place the planter with its plant in a cool, well-aired, frost-free place as soon as the leaves start to fall, and keep it there until the following May before moving it to a sheltered spot. Make sure that the soil in the planter does not dry out. Winter protection: As long as it is not too big, you can protect the branches of your fig tree from heavy frosts. Draw the branches together, tie them with rope and cover for winter with corrugated cardboard, plastic bubble wrap or garden fleece. Pile up leaves as a warming mulch around the base. In the past, it was quite common for figs to be grown under glass. However, as they have very large leaves they may cast too much shade over other crops in a domestic greenhouse filled with mixed plants. But if you have room for a plant and you can keep the temperature constant, your fig tree should produce abundant fruit. Taking cuttings from a fig tree: In winter cut off one of the previous year's shoots complete with its heel - a fragment of bark - and a terminal bud. Plant out the cutting, protecting it from frost with dead leaves or straw.